Michael A. Hammer, a career member of the Senior Foreign Service, currently serves as the Acting Assistant Secretary and Principal Deputy Assistant Secretary for Public Affairs at the U.S. Department of State. 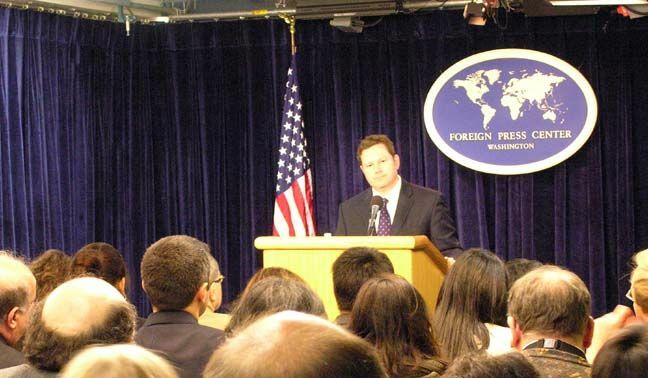 Prior to this assignment, Mr. Hammer served as Special Assistant to the President, Senior Director for Press and Communications, and National Security Council Spokesman from January 2009 to January 2011. Previous assignments at the National Security Council include Deputy Spokesman and Director of Andean Affairs. Since joining the Foreign Service in 1988, Mr. Hammer has served abroad in Bolivia, Norway, Iceland, and Denmark. In Washington D.C., Mr. Hammer has also served in the Department’s Operations Center and as Special Assistant to the Under Secretary for Political Affairs. Mr. Hammer holds a B.A. from Georgetown University’s School of Foreign Service and master’s degrees from the Fletcher School of Law and Diplomacy at Tufts University and from the National War College at the National Defense University. Mike Hammer has been Acting Assistant Secretary for Public Affairs since March this year. As Acting Assistant Secretary, he leads the Bureau of Public Affairs and reportedly manages a staff of over 200 employees. WaPo's profile calls him "the "chief operating officer" of the State Department's public affairs team." He previously spent two years in the Obama White House as spokesman for the National Security Council.Mr. Hammer who grew up in Latin America, living in Honduras, El Salvador, Colombia, Venezuela and Brazil is fluent in Spanish and speaks French and Icelandic. If confirmed, Mr. Hammer would officially succeed P.J. Crowley who left post abruptly after making a controversial statement over DOD's treatment of Bradley Manning.